We’d love your help. Let us know what’s wrong with this preview of Climbing Colorado's 14ers With Sawyer by Josh Aho. Climbing Colorado's 14ers With Sawyer chronicles the eleven year quest that a golden retriever named Sawyer, and his owner, Josh, went on it attempts to become the second dog/man team in history to climb all of Colorado's fourteen thousand-foot peaks. This book of adventures tells a tale of: fun, fear, fanaticism, frustration, physicality, fourteeners, and faith. Go to www. 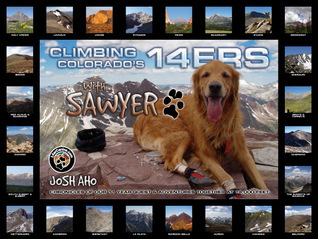 Climbing Colorado's 14ers With Sawyer chronicles the eleven year quest that a golden retriever named Sawyer, and his owner, Josh, went on it attempts to become the second dog/man team in history to climb all of Colorado's fourteen thousand-foot peaks. This book of adventures tells a tale of: fun, fear, fanaticism, frustration, physicality, fourteeners, and faith. To ask other readers questions about Climbing Colorado's 14ers With Sawyer, please sign up. Such an inspiring book from start to finish! Highly recommended if you are into climbing and/or pets!